As you can see it’s a no frills list. Everything is as cheap as chips and there are no real upgrades or special abilities apart from Biggs. The aim was to get as many ships on the table as possible. The A-Wings thrust forwards and run interference until the B-Wings get close enough to let loose. Biggs is there to protect whatever I see as most worthy at the time and to be fair this worked best when Biggs was taking fire away from the B-Wings. The results were pretty mixed; the list fared reasonably well, dishing out damage where it needed to. As was expected, Biggs died early and is pretty much the first to die in every game. 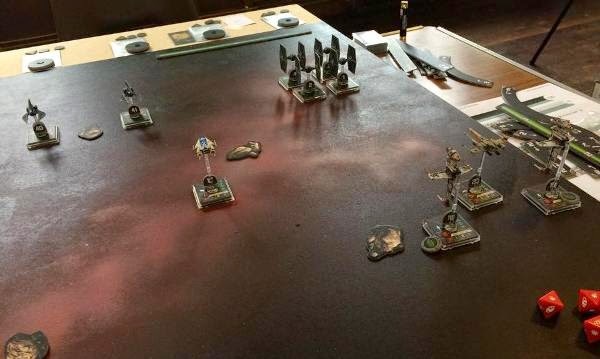 The A-Wings as a whole are a bit hit and miss, using their evade action means they can last a long time and are generally an annoyance for the opposition. They never hit big but can generally wear ships down, and their maneuverability came in very useful on multiple occasions, allowing them to get behind an enemy at every step of the game. The B-wings where an odd fish, as long as they where pointing in the right direction they dished out a lot of damage, but as soon as I got a TIE on my tail they were pretty much toast. If there was anything I would change, at first glance it would be the R2 astromech; it did nothing for me. Getting rid of it completely would have reduced my points to 99 and given me initiative, not that it would have mattered in most games but occasionally a guaranteed first shot from Biggs would have been nice. 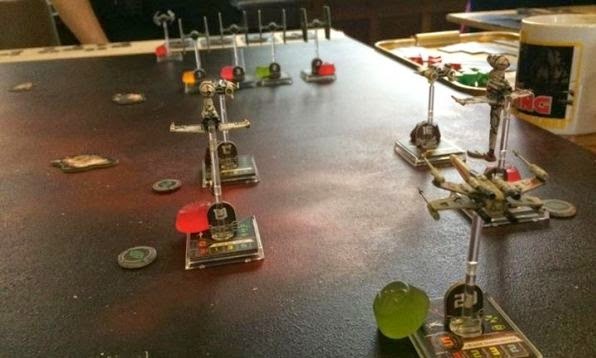 My first game was against a TIE swarm (by the way the tournament was evenly split between Imperial and Rebel players, so the listings where fixed to ensure that the games where mostly Imperial versus Rebel). The list was comprised of 4 TIE fighters and 2 TIE Phantoms. I got tabled (which means I lost every model on the table) and I only took out one TIE fighter in return. I was quite simply out-piloted. Nothing on the table had a particularly nasty set of skills and, horrible as they are, the Phantoms really didn't get into range until a three turns in. The problem was simply space, with a block of four TIE fighters and 5 of my own ships there just wasn't room for manoeuvring. 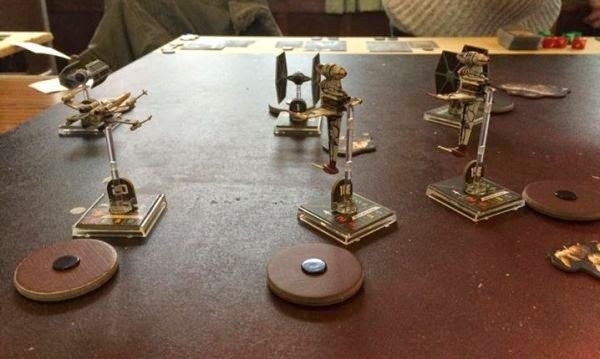 It didn’t help that I flew the B-Wings straight into the fight, largely ignoring their ability to barrel role. The second game was my only success of the day, a couple of TIE Fighters, a Tie Defender and Darth Vader in a TIE Advanced. Again the spread of ships meant very little in the way of special abilities. Here I was a bit more cautious, in tournament rules you are playing against the clock so I concentrated on knocking out the expensive ships first. My firepower was split between Darth Vader and The Defender, completely ignoring the fighters. The idea worked, I managed to blow up both ships I was aiming for, only losing Biggs and one A-Wing in the process. Time was called and I won the game on points. I don’t think I won by any particularly fancy flying or great list, in fact I was taking advantage of my opponent splitting up his ships and changing my target when the opportunity arose so that I was firing everything at those two ships every turn. The third game was the closest game of the day and definitely the most fun. I faced Darth Vader and 4 TIE fighters, all with swarm tactics. No matter what I did, my ships where firing second as the chain reaction moved Vader’s pilot skill of 9 down the line of ships. In all honesty, my tactics where a bit of a mess, rather than try and plough everything into Vader I concentrated firepower on the TIE Fighters one at a time, slowly whittling them down. The A-Wings maneuverability came into its own as they often got behind the TIE’s at range 1. As both fleets got thinned out the game became a war of attrition, neither of us could gain the upper hand. However, slowly but surely I started losing ships, until with only a few minutes left on the clock I was left with two A-Wings against Vader and two TIEs. At this point I realised I couldn't win, the enemy had 64 points left on the table, I had 30. 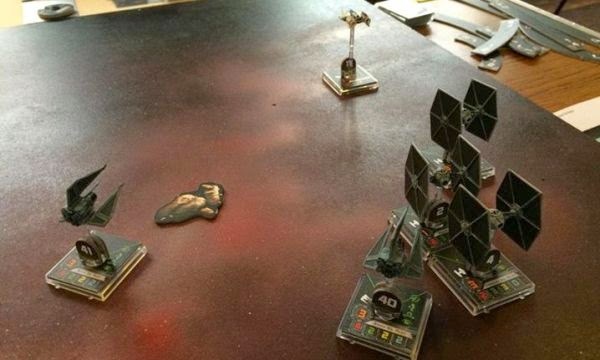 No matter who I took out I didn't have enough attacks left to take out all three ships, I could either take out two TIEs or Vader, either of which would have left 32 points on the Imperial table. But I wasn't going to go down without a fight so used the odds in my favour and concentrated on the TIE Fighters, destroying them both. Time was called, the Imperial player had destroyed 70 points of my ships, I had destroyed 68 of my opponent’s. I don’t care what you say, I’m calling that a draw! The final game was the least enjoyable of the day. 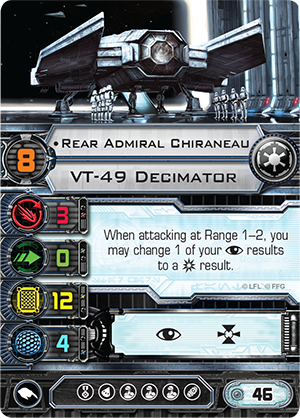 I faced Rear Admiral Chiraneau in the VT-49 Decimator, who was so tooled up he came to around 70 points, a TIE Interceptor took up the rest of the points. Two things caused my ultimate demise in this round Chiraneau’s special ability and a proton bomb. Chiraneau’s ability allows the player to convert a focus to a critical hit. I’ll say that again in case I wasn't clear; it turns a focus into a CRITICAL hit. It’s an extremely powerful ability, not only increasing the odds of causing damage but causing critical damage in the process. This on its own is extremely annoying but it’s the proton bomb that really screwed me over. The proton bomb causes one face up damage card to every ship at range 1, irrespective of shields. An A-wing was sitting right on top of the bomb and Biggs was very close. The A-Wings was destroyed immediately due to it being the dreaded 2 damage critical card. Biggs was already down to one hull so he went as well, bugger. I spent the game concentrating fire-power on the Decimator, mainly due to the massive amount of points in it, this may have been a mistake as I got tabled without taking down a single ship, it’s of little solace that I only needed to score one more hit against the Decimator to take it down. So the real question, could I have down better, yes. Lets ignore my list for a second and get down to my real problem, piloting. In a lot of cases I ended up moving over asteroids or even worse landing on asteroids, not only causing me damage but preventing me from firing. Because I was moving first I often ended up in some pretty tight spots and ended up causing a motor way pile up rather than swooping in and out of combat, instead of flying by the seat of my pants, I was just pants. The main issue with my list as I saw it was Biggs, he was a lot of points just to act as a sacrificial lamb. Biggs either needs something to help him survive longer, or he should be protecting something more valuable. If I were to run a list similar to this again I would look at a replacement for Biggs, maybe a third B wing or some tooled up A-wings. The A-wings to be honest where worth the points. At 15 points apiece they paid for themselves, even if they always fired last. I am wondering whether increasing them to three in the list is enough to annoy the opposition and I'm also wondering if some form of swarm tactics with them may prove beneficial. I’m still trying to work out the sweet spot for the B-Wings; the blue squadron pilots aren't bad for a bargain basement B-Wing but I feel they need a little more edge to make them more viable. Conversely I've flown a tooled up Keyan Farlander before and it’s too tempting to put too many points in one ship. The trouble with the B-Wings is that those 5 shields and 3 Hull look like a lot, but when you’re only rolling 1 dice in defence, those shields quickly get knocked out. In the end I had a highly enjoyable day. The event was very relaxed and sociable and even though the Decimator list wasn't nice, nothing in the competition felt too cheesy. I should give a big should out to Worcester Wargames for organising the event and all the hard work that went into making the custom star field tables.